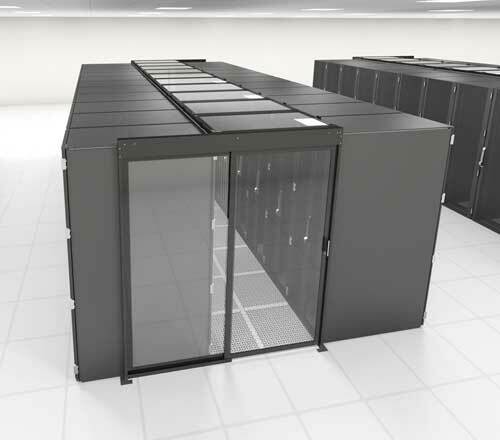 The Cool Shield aisle containment system consists of hundreds of components which have evolved over the course of helping hundreds of customers get the most out of their cooling infrastructures. 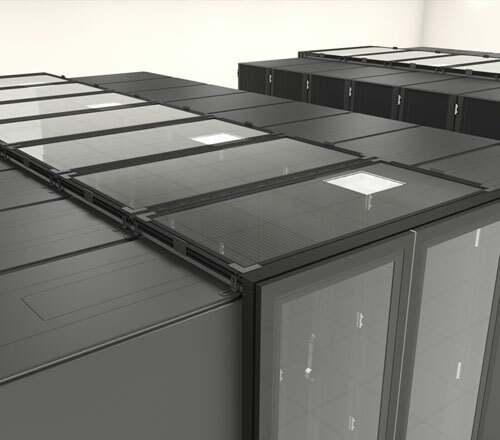 As a result, every containment project is unique and presents new challenges which enable us to improve our design to extend the capabilities of the product line. Above all, the Cool Shield Channel is the heart of the system. 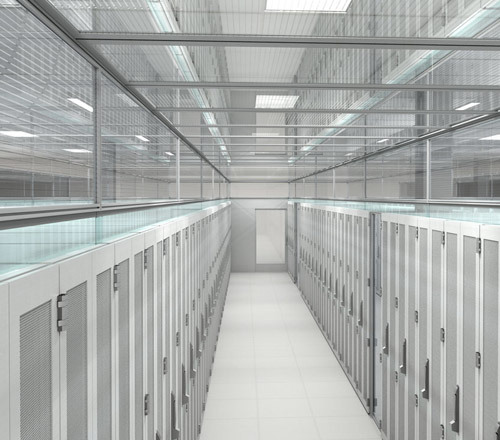 In addition, the unique combination of threaded and slotted sides allows for the channel to be configured in seemingly endless ways. 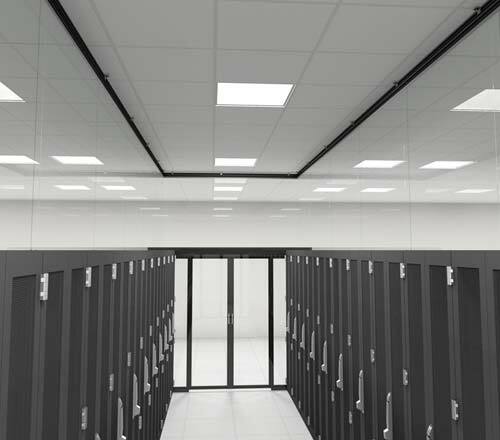 Accordingly, the Cool Shield channel design allows for great adaptability when mounting HAC (Hot Aisle Containment) or CAC (Cold Aisle Containment) systems to the ceiling, strut channel, support beams, cable trays, threaded rod, concrete ceiling or just about anything. Design for installing under water based fire suppression systems. 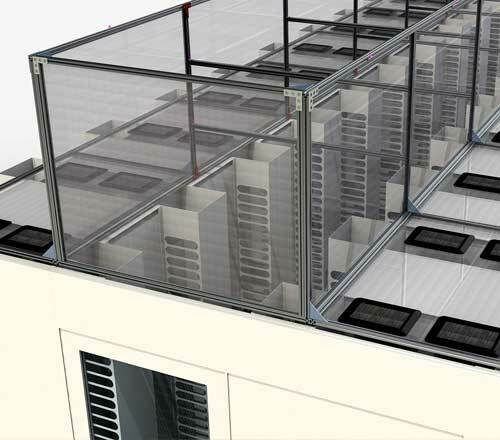 Cool Shield aisle containment fixed vertical panels are a very attractive and efficient method for managing the airflow in particular for hot aisle or cold aisle containment applications. 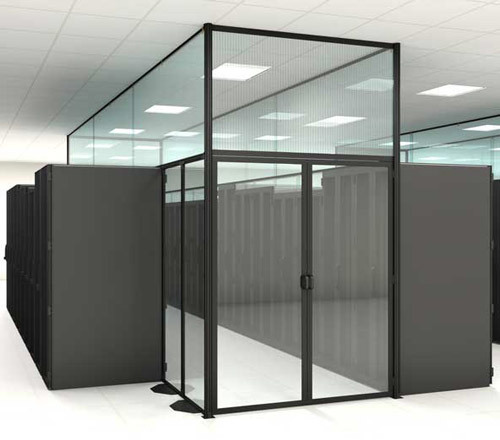 The Cool Shield sliding vertical panels design provides the exceptional sealing capabilities and similarly high aesthetics of a solid panel solution without restricting access to the cables behind the containment panels. 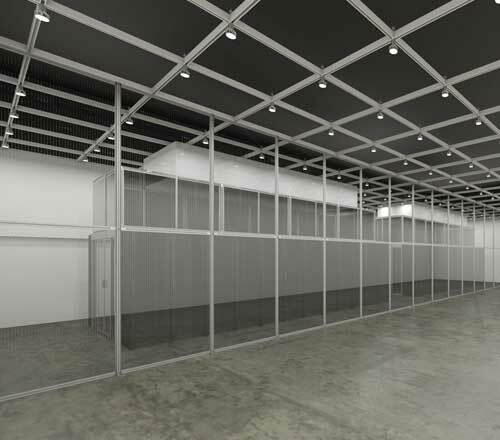 Clear containment panel walls, full or partial walls, simultaneously isolate a cold or hot aisle by filling gaps between or above enclosures. 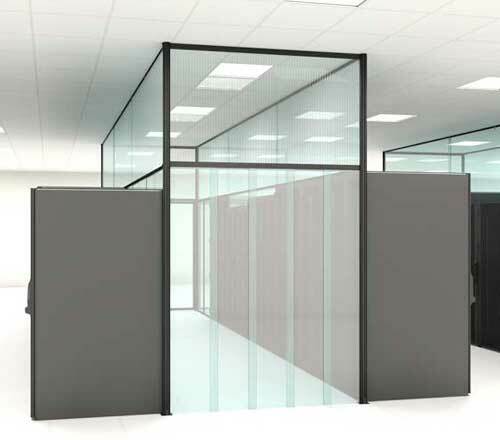 Framed panels keep aisles contained when missing cabinets/rows. Specifically made to size cabinets, swap out as you add to rows. Overlapping vertical strips provide effective and efficient approach to sealing aisle entry way. Attractive and functional self-closing sliding door system – aisle entry ways. 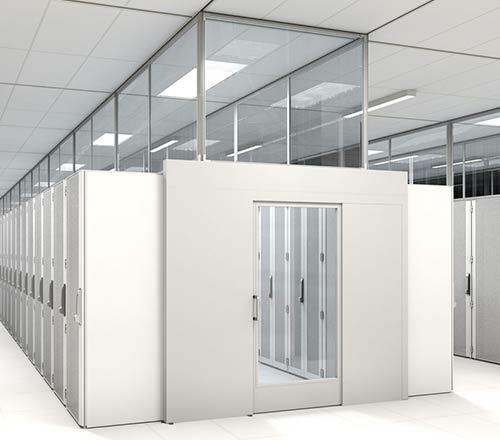 Double sliding door system provides attractive and functional containment to aisle entry ways. 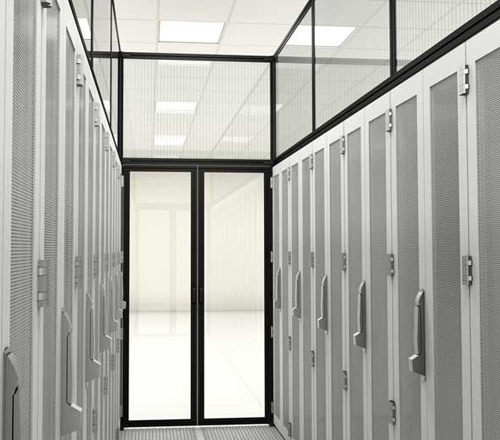 Self-closing sliding door system provides attractive and cost-effective containment to aisle entry ways. 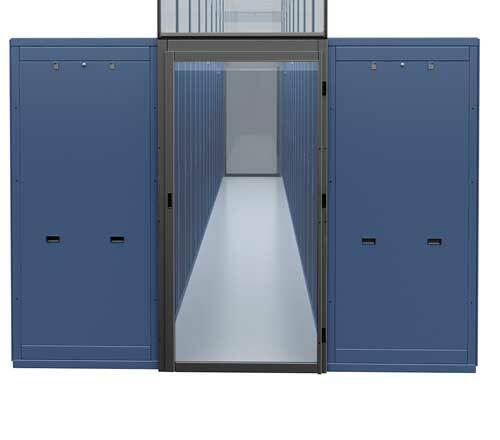 Self-closing hinged door system provides attractive and functional containment to aisle entry ways. Hinged door solution provides high performance and equally important superior aesthetics to your aisle entry ways. 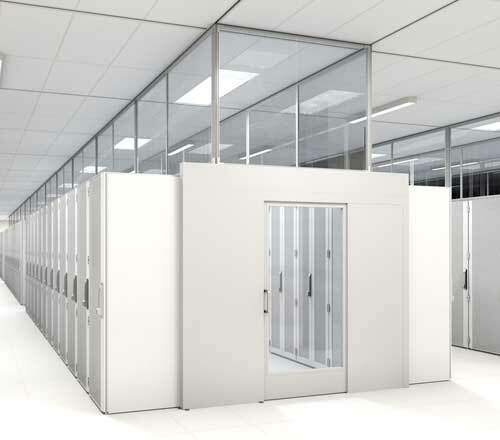 Effective and efficient vertical strip curtains overlap, to separate data center aisle supply and exhaust air. 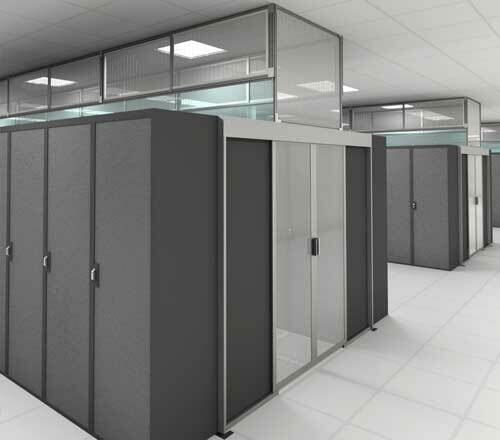 Create a cost effective floor to ceiling partition wall to separate active from inactive spaces in the data center. NEW Cool Shield self supported Containment system. 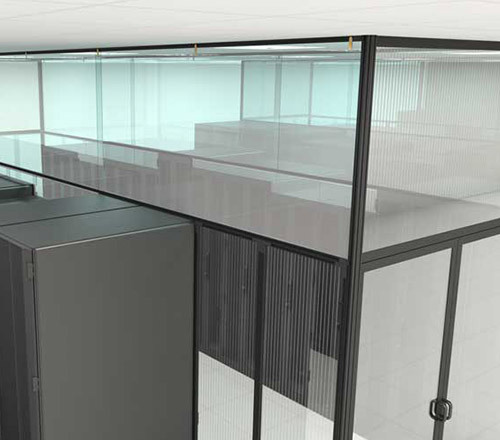 The new self supported containment system from Cool Shield is ideal for installations without existing support from cabinets or an overhead ceiling. Furthermore, the self supported system is used for hot or cold aisle containment configurations. 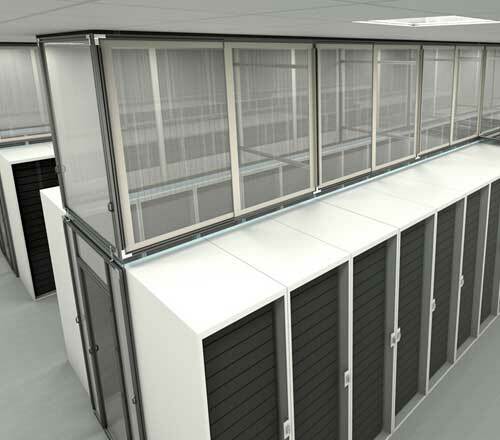 Most important, the cornerstone of the self supported containment system is the heavy-duty Matrix vertical post which attaches the containment frame, doors and cable tray supports. 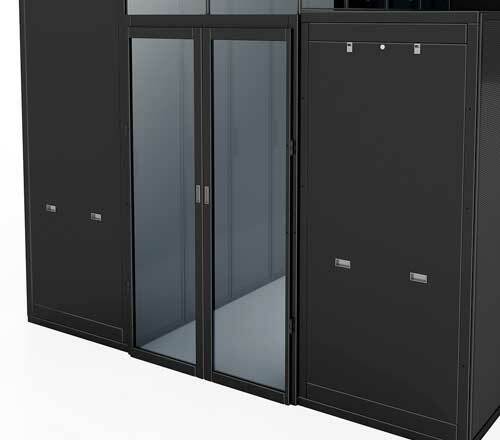 The system is thus configured as fixed panel, sliding panel, ceiling panel or flexible strip containment. Moreover, posts also provide vertical support for hinged aisle entry doors. 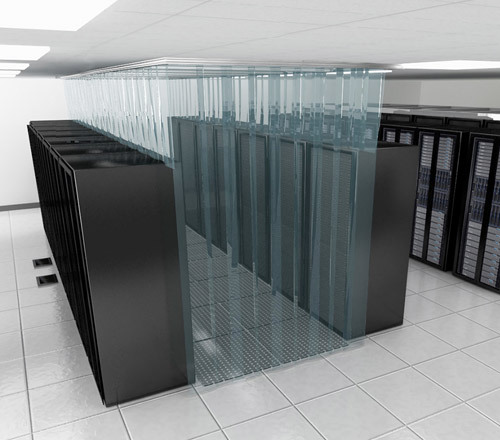 Cool Shield is the most flexible Aisle Containment system available. A variety of flexible strips and solid panels used with the Cool Shield channel to create the aisle containment barrier. 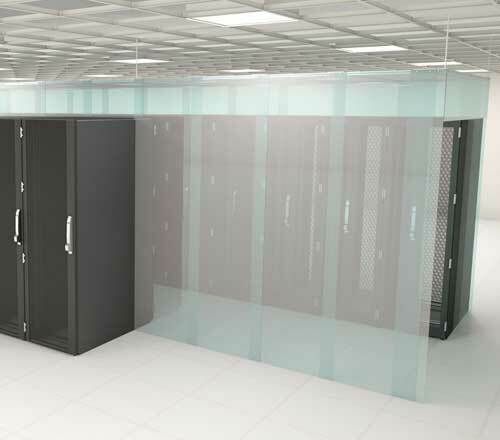 First, overlapping flexible strips used above server cabinets and in aisle entry ways. Furthermore, ASTM E84 Class A strips available for compliance with NFPA 75. 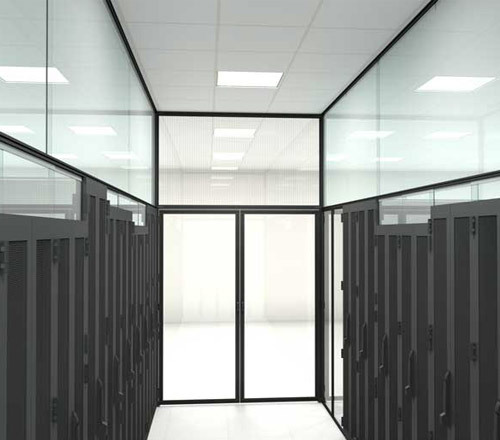 Likewise, solid panels are used vertically from cabinet to ceiling or across the aisle to form a ceiling. Finally, our panels meet UL94, ASTM E84 Class A and FM 4910 ratings are available. 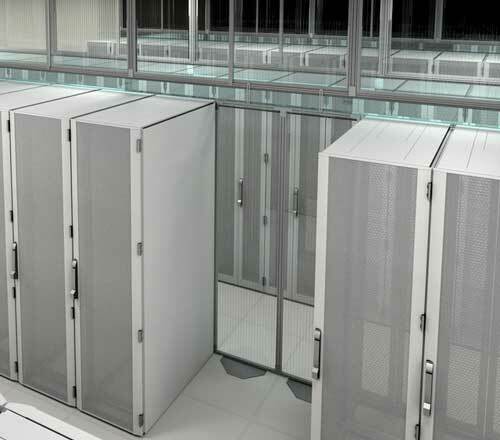 In addition to being highly functional and customizable, Cool Shield is extremely cost competitive compared to other aisle containment systems. As a result, high volume manufacturing of our exclusive designs for channel extrusions, brackets, gaskets and other accessories keeps our component costs low.